As Mythic Heroes, Emerald Suit, and other amazing items are being released, the way players approach battles in League of AngelsⅡis always changing. Are you sticking to a static squad line-up? It’s time to embrace change! Introducing Hero Convert, an exciting new system coming in this week’s update that allows players to convert one Hero to another with only 1 click! 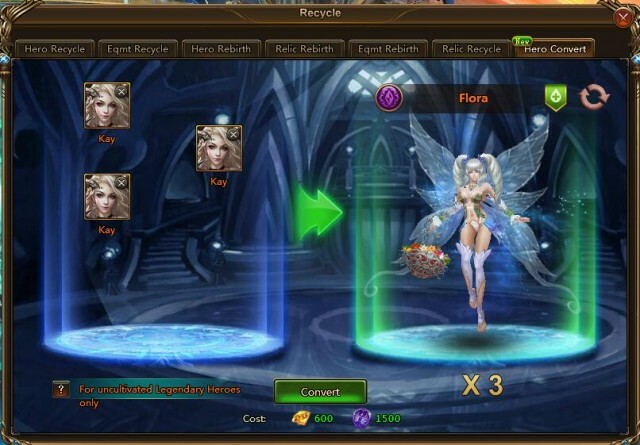 1) Players can spend certain amount of Diamonds and Souls to convert a Legendary Hero into another Legendary Hero. 2) When players are below level 70, they can only convert to Heroes of the same Kingdom; while players level 70 and higher can convert to Heroes from any Kingdom (e.g. Convert a Midas Hero into a Tempest Hero). 1) Click on plus signs on the left to open the list of all of heroes that are qualified to be converted. You can add different Heroes at the same time, up to 5 to be converted. Players below level 70 can only add heroes of the same kingdom; players who are higher level 70 can add Heroes from any Kingdom. 2) After the step 1, click on the plus sign on the right to select the Hero you want. 6. Cost: Converting 1 Hero will require 200 Topaz and 500 Souls. 1.Quick Change your Line-up: Many players chose their Kingdom during as a “novice”, and now wish they could use Heroes from another Kingdom but were stuck with their first choice. But with the Hero Convert System, players can easily rebirth their existing Heroes first, then convert the level 1 Heroes into any Hero they want and cultivate them again with the returned resources! 2.Ritual Summon: With the Hero Convert System, the Ritual Summon definitely brings you the Hero you want! Whatever legendary Hero you get, you can convert them! 3.Random Heroes: After Blitzing Elite Dungeon and opening random Hero Shards Chest, players often collect 80 Shards of a Hero that they might not want. If they recycled this Hero, they can only get 2000 Souls which are equal to 50 Shards in Hero Shop at best. But now they can convert it into the Hero they want without refreshing the Hero Shop over and over!